NEW ORLEANS (CelebrityAccess MediaWire) — The historic Saenger Theatre, hard hit by Hurricane Katrina in 2005, is finally preparing to re-open in the fall of 2013 after undergoing a major rehabilitation. 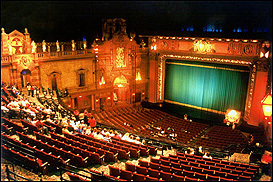 After being heavily damaged by both wind and water during Katrina, the theatre has undergone an extensive, 51 million dollar renovation that was the result of a partnership between state, local and federal governments as well as private institutions, overseen by theatrical management and development company ACE Theatrical Group. "We successfully tap into local communities via grassroots efforts and on-site management, allowing us to know exactly the style of art, music, theatre, dance or entertainment each community would like to see in its neighborhood," David Anderson, President and CEO of ACE Theatrical Group told BroadwayWorld. Originally opened in 1927 in downtown New Orleans, the theatre was an exemplar of Italian Renaissance architecture and was the flagship of the Saengar Theater chain, which operated venues throughout the American south. As with many similar theatres, the Saengar saw service as a movie house before being restored in 1981 when it was converted into a multi-purpose performing arts facility, playing host to numerous touring Broadway shows as well as touring, headlining musical and comededic artists.